I will be one day SAHM again tomorow, this is the second time in this year in this month too. First time is being 2 days! This round is my MIL has to do medical check up. She spotted her right breast has a lump (tumor?) since last Saturday. Ask her to go for check up soonest possible, as we wouldn't know what it is, better consult doctor/specialist to verify it! No point guessing this and that, we are not expert. This morning she went and see normal doctor, the doctor advise her to go scanning in private hospital as he doesn't has that facility. She get the doctor to write letter to refer her to Muar GH. This Muar Hospital has specialist to check on this. Our ex Health Minister's kampung was from Muar, he spent a lot of time and effort in promoting this hospital as well. Now this hospital being awarded as Specialist Hospital too. I rang up the hospital just now, to find out more info and wish can make appointment via phone, but they said we have to go to Clinic Payu Daru section, do the scanning and biology first. If found the lump is cancer or harmful , then make an appointment to remove it. 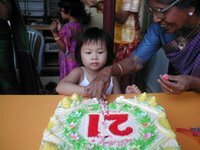 If she has to wait for so long only can go for surgery(just in case la), we will switch her to private specialist. It was MIL's intention to for GH, as she said private hospital might cost a lot. Well, if has to spend many days on waiting, then better go for private one. Anyway, tomorrow she just go and do a check up or scanning first, let's hope the lump is not cancer or harmful to the body. If has to go for surgery, then I might be SAHM for some other days! Let's pray hard! 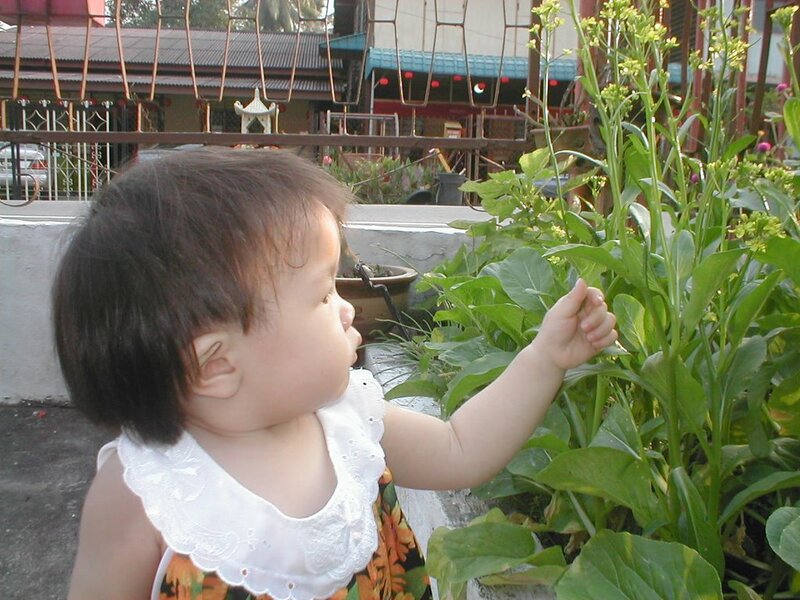 The very first word she speak is MUM MUM(Food), see how wai sek this little girl! Even now also always ask for mum mum, and guide us walk to kitchen to look for any mum mum. See, the list no mention on MUMMY. 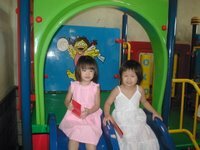 I am still waiting and waitng.......nowsaday keep asking Wien to teach her say MUMMY, hehe, hope very soon can hear from her too, just like this little girl did!! She very clever calling her papa. 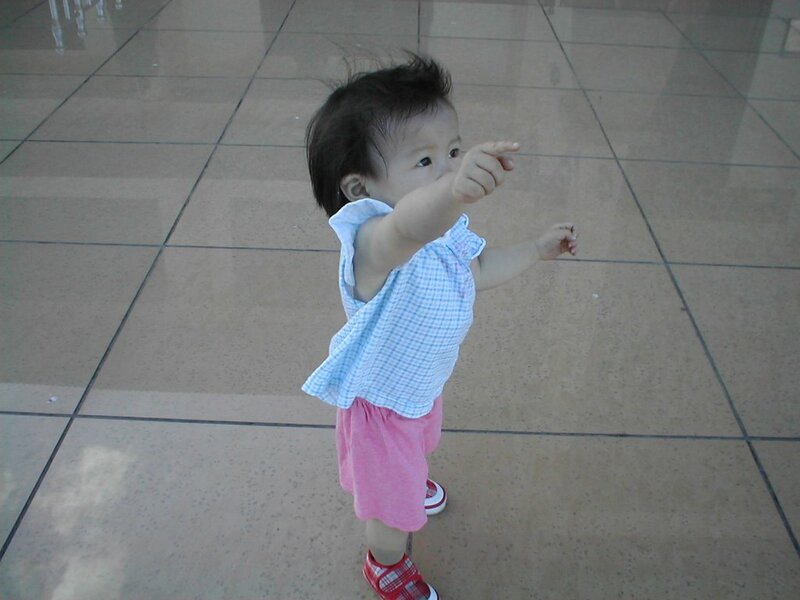 Once heard papa's car back from work, she'll quickly walk to gate and wait there. 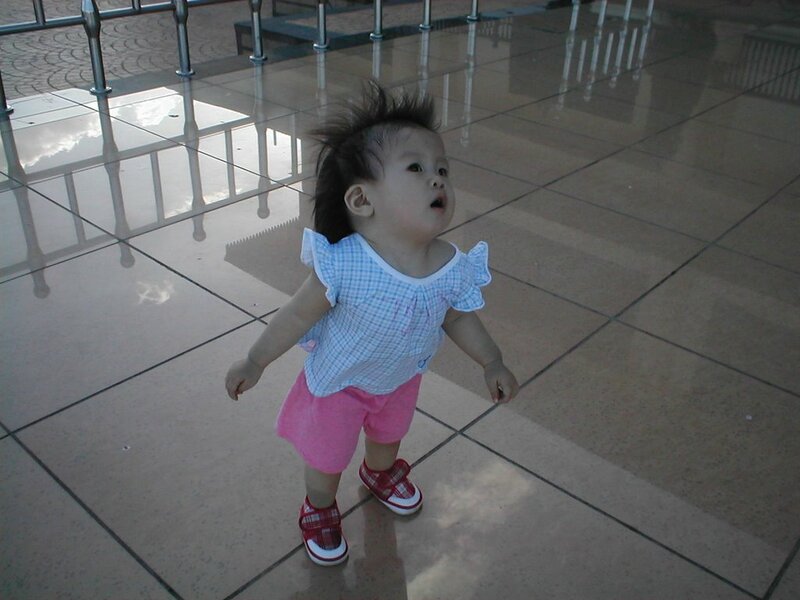 Once papa step out from the car, she start calling shouting papa papa non stop, until papa come and pick her up! After picking her up, she will manja-ly put her head to papa's shoulder! YOU!!! Dun take my naked photo! First of all, thank you for all the answers! Some answers really give me a laugh when it comes into my mail box, such as PA system, kacang putih container ( got hole at the end le, after put in kacang, sure bocor mah!!..hehe). What a good imagination! 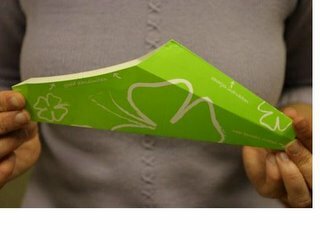 It's urination funnel for women.....click the link if you to know more information. OK, tell the story origin now. 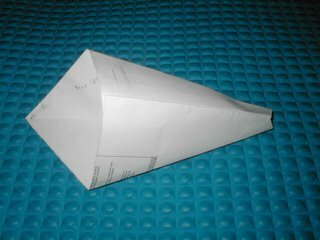 In fact, this urination funnel was made by my creative hubby; after he read the news & saw the image from internet. This is the images copy from internet earlier on. Then he made it using his own creative mind. 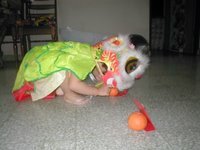 After he made it, as see in this post , he ask me to be the white mouse(白老鼠）pulak, to try how good it is. Of course I refuse...but he still begging me non stop!!!! At last I get Wien to try on it..hahaha...she is very curious though. 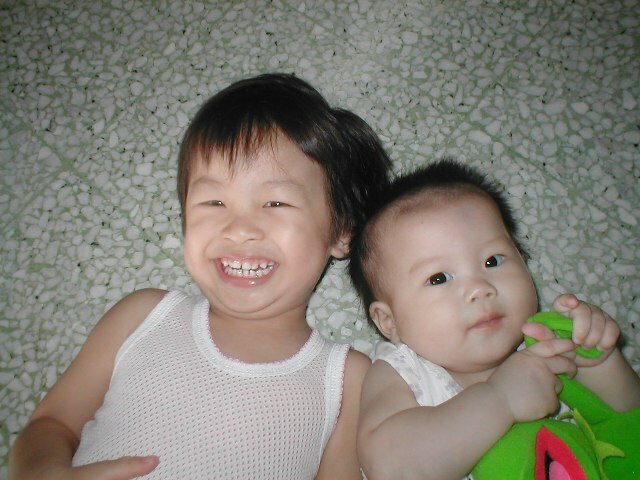 I still remember he make it around Oct 05, before our trip to HK/Shenzhen/Guangzhou. He even make few for me to bring during the trip, as I ever told him that I really scare of China's toilet (no door? half door? dirty?...many of u can imagine how China's toilet look like...arhhhggg). Very lucky, I no need to use them, as most of the toilet I visited there was clean, although no toilet paper. I saw this thing being sell in Watson too, while we shop for our thing before the trip! You can google it out for more information from other web site too!! Read the usefulness from here. Hey, ladies, we also can urine by standing position! I was sitting in living hall flipping the newspaper, Wien came to me with a book with her as she has some question to ask. 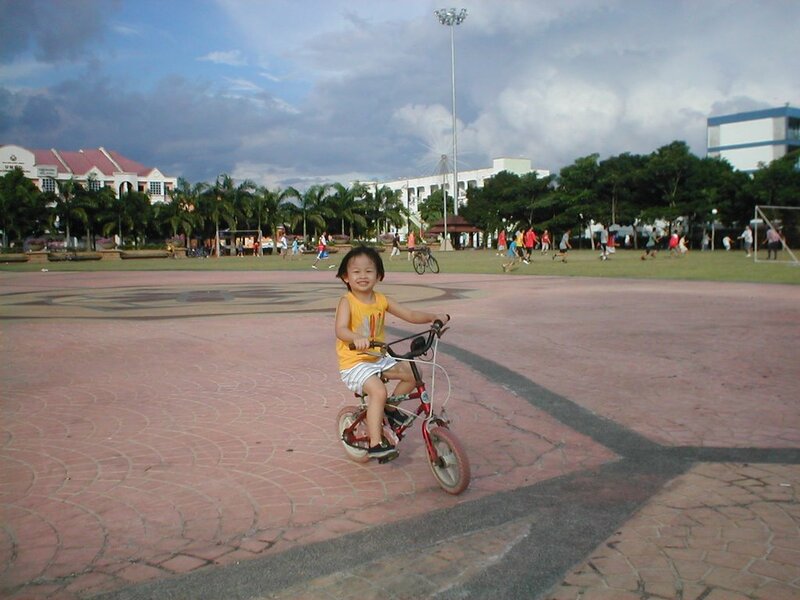 Before Wien finish her question, Lyon already on her way towards me. 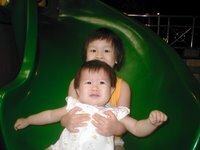 This little monkey girl going to push away her jie jie from me again!! In fact, most of the time she act like that if Wien sit with me or very close to me. She jeolous on Wien!! 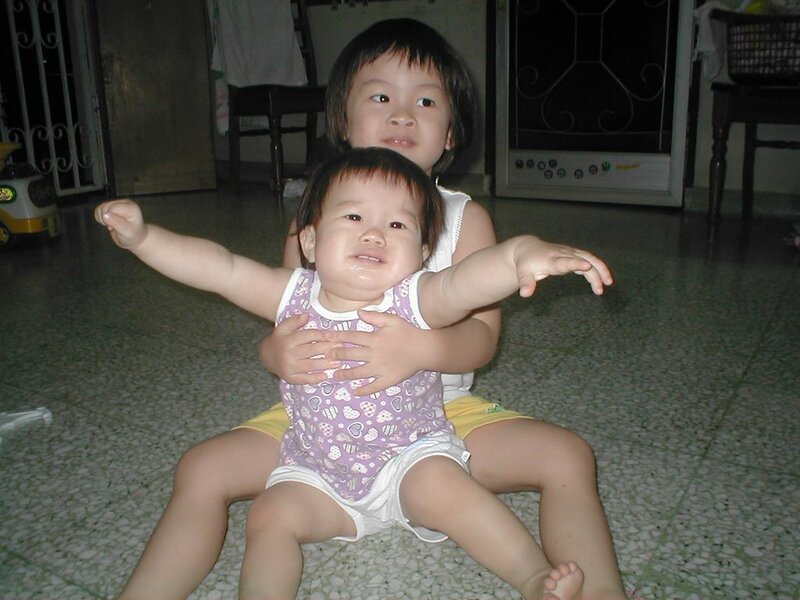 If Wien still with me, then she will start pulling her hair, or pull her hand away from me! 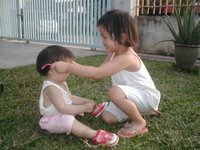 Each time I have to get Wien to look for daddy if Lyon behave like that! 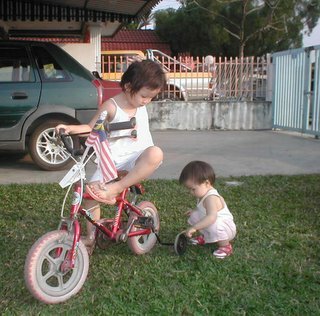 Been telling Lyon numerous times that she is not right but this little girl still behave the same. Sometimes naughty Wien will not let Lyon win, she will sit still there and push away Lyon pulak, so both of them fighting for the poor mummy! Daddy just watch and see the show till I shouted for help!! Hubby took the photos one evening around May 2005. The bird come and lay egg on our tree. 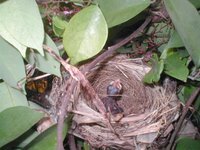 He noticed the mummy bird brought something to the tree, thought she was building up the nest, go and have a look, only realised there was 2 little birds inside the nest, open their mouth widely, waiting for the food! Wien want to see the little birds closely, so daddy carry her to peep them ! After that took some pictures of it. 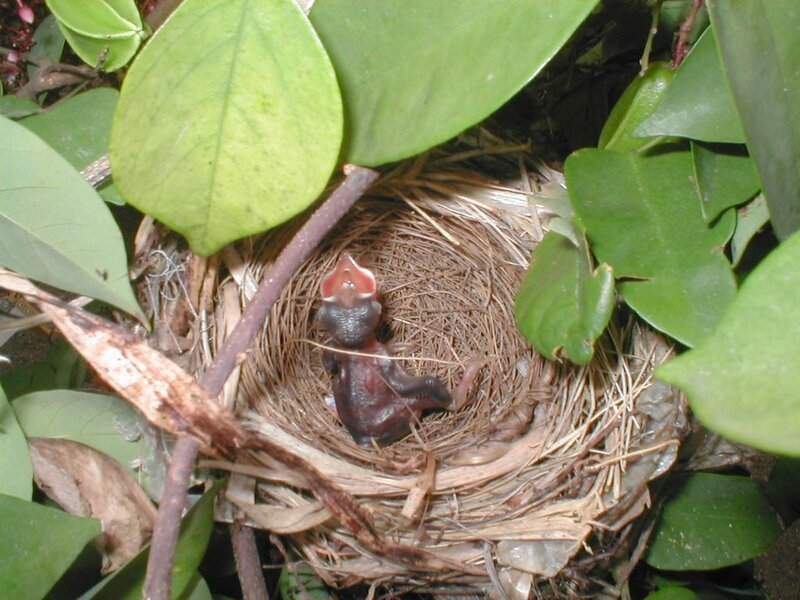 But so unlucky, the next day all the birds gone, left only the nest!! 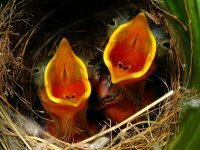 Must be the mummy bird brought them away from us, scare her little birds will be kidnapped by us!!! p/s: the nest still on the tree, we are hoping another mummy bird will come and lay egg there!! Let's wait & see! What an unlucky Sunday morning! 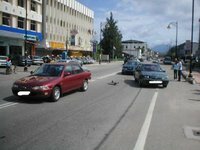 We meet a car accident on Sunday morning(19/02), 3 cars involved, including our car!! Here is the whole story……dun worry, none of us hurt, but got the shock only. 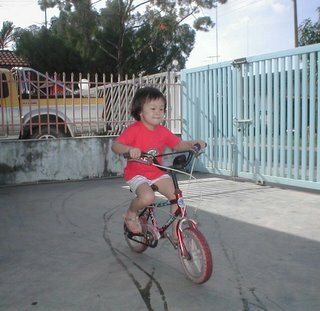 Hubby wants me and Lyon follows him to fetch Wien from her Sunday school. Usually I did not follow him as I need to do lots of house chores over the weekend..…! But hubby wants us follow too, he say to give Wien a surprise! Ok la, I quickly put the entire porriege ingredients into the pot and cook it; damp in all the cloth into washing machine, on power and let it washed. Remind MIL to watch out the porridge for me. 10.15am, we headed to the church since the class dismiss at 10.30am. Not forget to bring along camera too, as I want to snap photos for them. 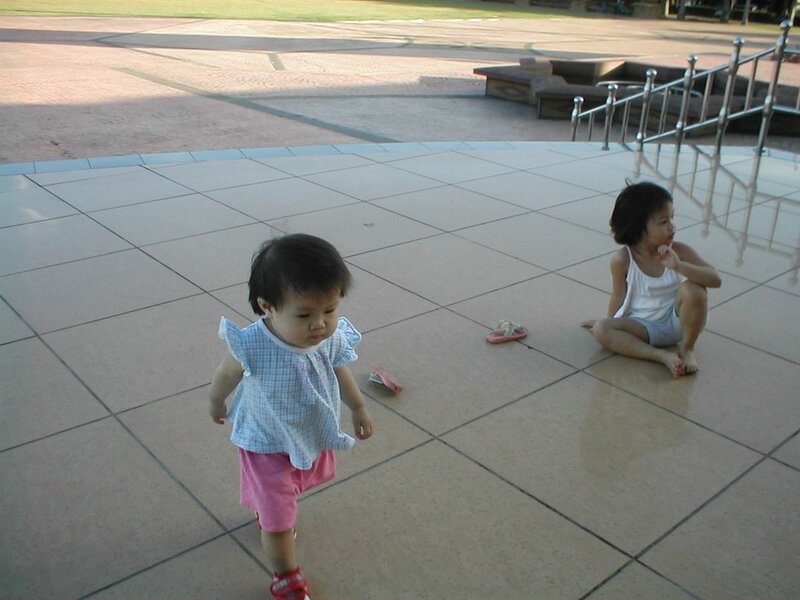 Wien is happy when see mummy and Lyon were there, she quickly run out from her class. Since the teacher still telling story to the class, I get Wien to sit still in the class. After 10 min, the class dismiss. Let them play a while around the church, and then we go back. 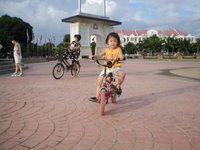 Daddy promised Wien to buy her lolly pop from 7-elevan if she behave today and being alone in the school, without daddy accompany. Before this she want daddy to be with her till end class. So daddy drove to 7-elevan. In the car, I told daddy no need to go 7-elevan la, since our fridge still got some extra. But he still want to go, main reason is to keep his promise to Wien. Many cars on the road, guess many of them just wake up to have their morning breakfast now. Lyon and I sit in front seat, while Wien sits at the back. Come to a junction, we want to turn right, so we stop in the middle of the road with right signal on. We stopped quite some time there as too many cars that cause we unable to turn right. Less than 1 minute (I guess so), I heard a big “bang” follow by all of us seem being push forward. I was holding tight of Lyon and at the same time I shouted to hubby what happen!! He look at the mirror, realized our car being hit kiss by others! Lucky none of us (especially the girls) hurt! Really thank GOD! Hubby gets down checking on the situation, but he wants us remain in the car. 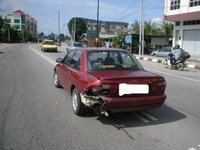 I saw the car which hit us is a Malay driver, then saw his wife quickly get down from the car too, with a baby in her arm. I curious what happen to the baby, so I also go out (carry Lyon with me but ask Wien to sit still in the car) and ask the women. 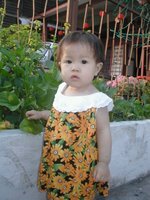 She told me just now her baby was crying but now very quiet and both hand very cold. But I noticed no bleeding on her and no crying too. The mother start panic, then another Malay drive offer either to drive her back or to hospital. 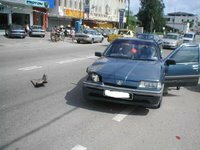 Then both mother and baby follow the car. Heard they stay nearby too. After that I only realized there is another car involved in this accident too. A Chinese family, husband and wife plus 3 girls. No one hurt in this accident but gave us a shock! The culprit driver (Iswara) claimed that he did not see our car stopping there, by the time he saw it, he pressed emergency brake but still hit us! The third car (Honda Accord ) follow too close to Iswara, also short of time to do emergency brake, so do the kissing to Iswara! 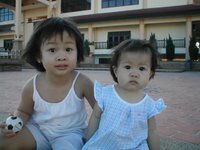 Hubby took some pictures with our camera, at the same time look for handphone to make phone call to family member get someone to fetch me and the 2 girls back first, since he need to go police station to do the police report. Both of us did not bring out our handphone, as we thought we will only go out for short while. So we only can make call to our house since none of us can recall either FIL or SIL’s handphone number. Very important, got to prepare a phone list and leave in the car, just in case anything happen! Within 10 minutes, saw SIL#3’s car, she came with her hubby. Reach home; saw MIL anxiously waiting for us at the gate! She must be very worry of us. She said lucky last week she went to temple to do the praying for hubby since hubby “fan tai shui”(犯太岁) this year! 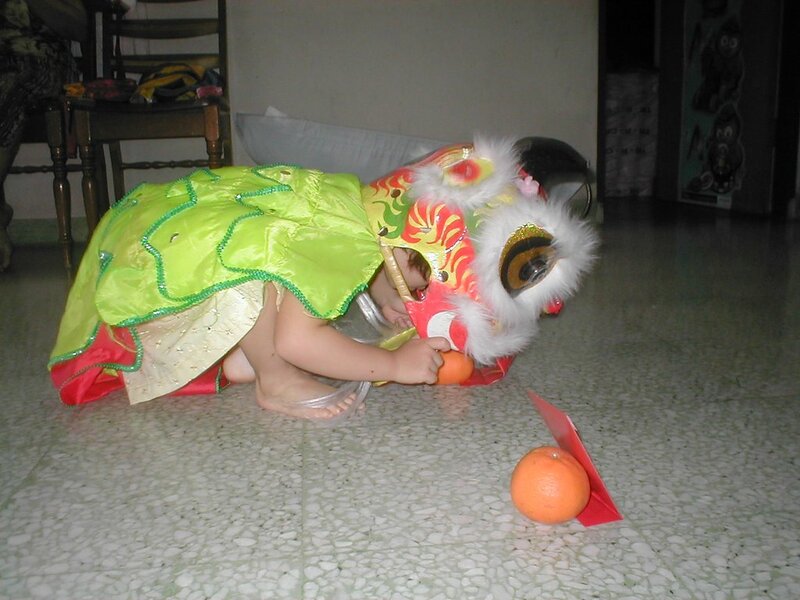 Hehehe….all the doggie are “fan tai shui” this year, better do the praying fast! Hubby heart-pain his car now, as he just spent about 3k last December to do the re-painting of the car body and change some parts of the engine. We plan to use for another 3-5 years before change to a new car. Now looks like is time to change for a new car! Photos taken on the spot, if u want the car plate number to buy, email me! 3 cars in a row. Hot hot hot!!!! very hot this afternoon.....not feel like want to go out to have lunch. Still having flu, coughing and headache. But I need to buy something, my face mask and cotton run out of stock already, got to stock up some. So, drive out alone during lunch break. After the quick shopping at Cosway, decide to ta-pau chicken rice as my lunch. The Si-tau-poh(ownner) quite familiar with my face as we (me and my colleague) use to go her stall. She chat with me while getting my lunch box done. 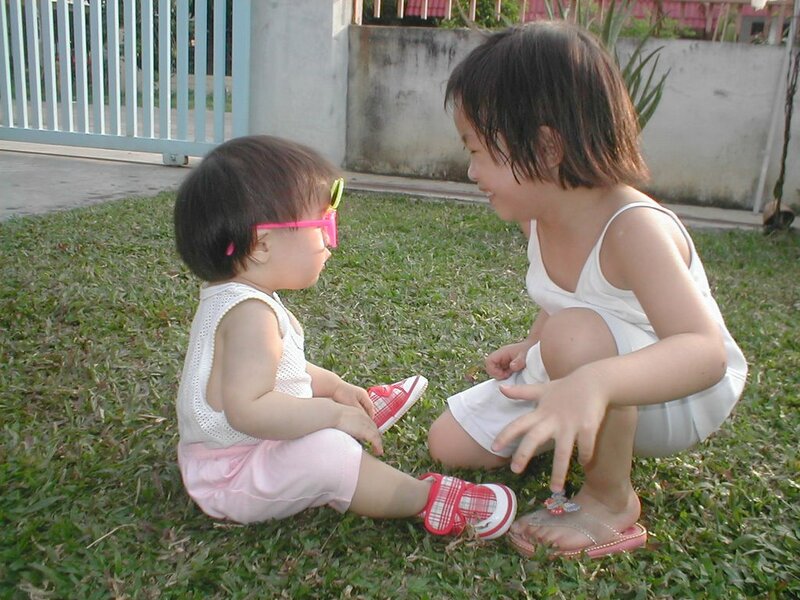 I was coughing then.... She: 不舒服哈？ (Not feeling well ha?) Me : 是咯！天气很热哩！搞得我酱咯！ (Ya lor, the hot weather cause the sickness la!) 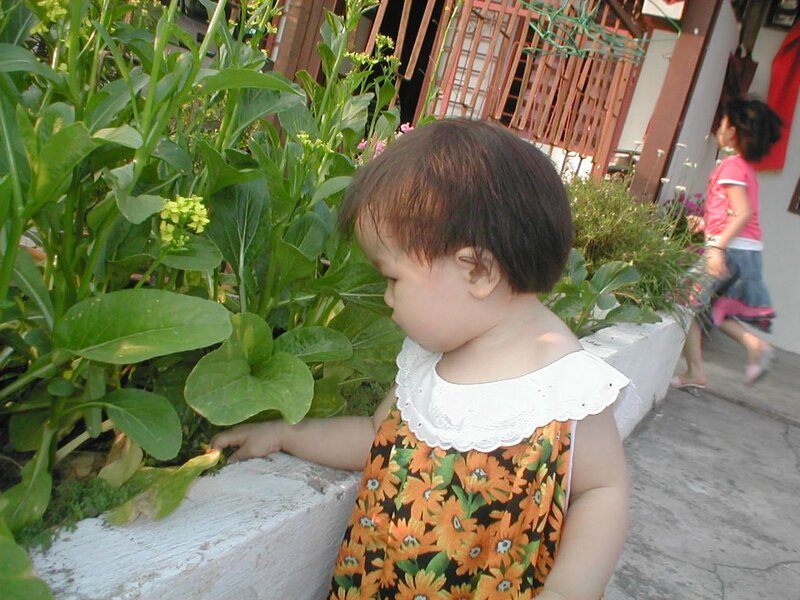 She: 不是天气的错啦！现在是生病的季节。 Not becos of weather la...now is the season la, sick season. 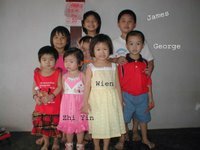 Me: 我的女儿传给我的咯。 My kids lor, pass the germ to me! She: 哈？我还以为你还没结婚呢？所以我一直叫你小姐！ Hah? I thought u still single le, that's why I keep calling u MISS! Me: 哈哈！我真的看起来年轻吗？ Haha, really I look that young meh? She: 是啦，你不讲我还不知道。。。 Ya lah, if u din tell me now I still think u single .... Me : Auntie, 你不要寻我开心啦！ Auntie you dun make me happy la! She: 我没有骗你啦！ i din bluff u la... Wah..suddenly my headache gone...kekeke...sure happy lor, already mother to 2 princess, yet still got people think I am single!!! This is the advantage of being a small size women....muakhhhhhhaaa p/s : But hor...still got someone call me Auntie le...!!?? Although we never meet before. Hubby and I hardly can snap good photo for Wien & Lyon when they are together, I mean they are not facing the camera properly. 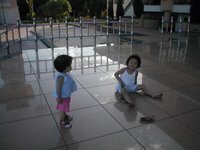 Each time want to snap, naughty Lyon will either walk away or push Wien away! 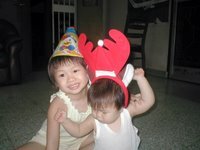 I also face difficulty to have the 2 girls to be with me to take photo, incooperative Lyon will push away Jie Jie too! As she want to monoply this mummy !! That's why hubby has to be quick hand quick leg to snap it if there is the chance! What I can do is to play trick with Lyon by offering her food, then she can sit still and let us take photos, with Wien beside her. See, how greedy & wai sek this little girl! 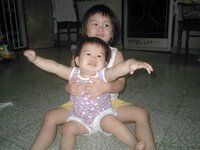 Another way is get Wien to stand behind me while me getting Lyon sit on my lap....haih..take photo also so difficult!! Few photos here clearly shown that Lyon dislike to take photo with Wien... Well when they are playing or eating together, we can take the photos, but both not facing camera lor. Hubby claimed that like this only look natural mah, look at camera sometimes will look weird and 不自然！ So far these are the two I like the most!! Guess what is inside the luggage? Some of the soft toys (some only le, not all!!) 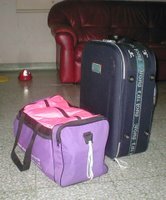 collection were kept in luggage and kept somewhere in the room. Still got others hanging or lying in my room, living hall or everywhere! Wien and Lyon not really fancy on soft toys but they'll still play with them! In the collection, the Hello Kitty series is hubby bought for me..ya, he is eating lots of McD at that time...hehehe. Now mostly become their toys too. Got to separate them from kids collection, else sure hubby make noice wan! The rest of them are mainly present from mummy, SIL, hand-me-down from my sister or SIL. 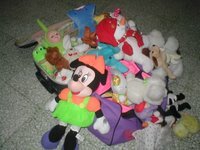 I stop buying soft toys since Wien is 2, as I see the collection keep incresing, sure one day no space to keep them! 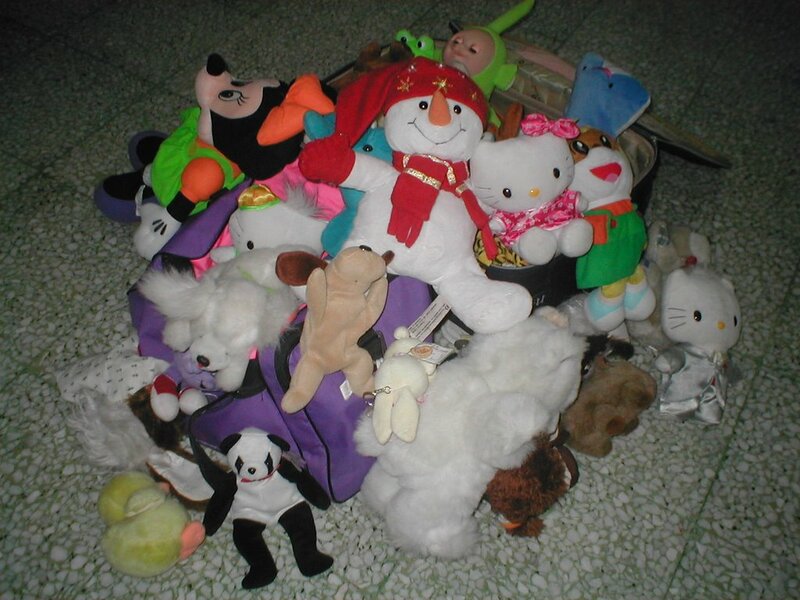 Other than soft toys, the girls still have other boxes or container that keep with other toys or playing stuff, such as lego, puzzle, remote control car/cars, fishing stuff..etc etc..the list go on.....look like one day must really sit down and sort it out properly and keep properly! Yesterday evening, I get daddy to bring both girls to big field again, becos Lyon so happy running up & down there in her previous trip. I follow them too, normally I did not join them as I want to prepare the dinner; but yesterday I so tempted to go with them, so without think twice, I went! 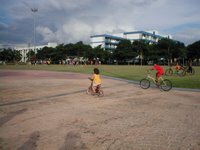 After all, MIL was at home, she will cook then..kekeke.... Daddy knew I will join them, so he brought along bicycle too, other than the kite! As he know I can kept an eye to Wien too while she is cycling. Before this they only play kite in the field. 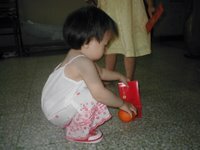 SIL's youngest daughter was in our hosue, she want to join us too! She is Wien's best playmate so far! Lyon very excited when we reached there, keep kicking me to put her down instead of carrying her. So, let her walk by herself. 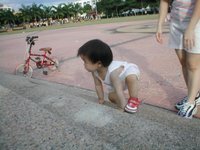 Again, she walked to the stairs case, starting climbing up and down, just like her previous trip! 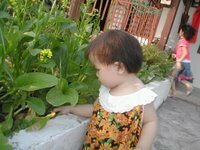 I not manage to snap photos last time as I need to take care of her while she at the staircase, too dangerous for her, she might fall down anytime one! This round get daddy to snap photos while me holding her hand! 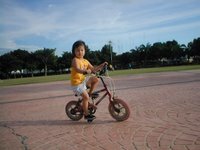 Wien seem expert in her cycling now, she can handle well the balancing. If she fall down here I cannot imagine the hurt!! As here all with cemented floor. 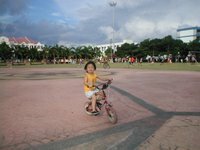 Wien had been flying kite few times here, but daddy no chance to snap photos for her, as he is busy playing kites too! Today he manage to do it. 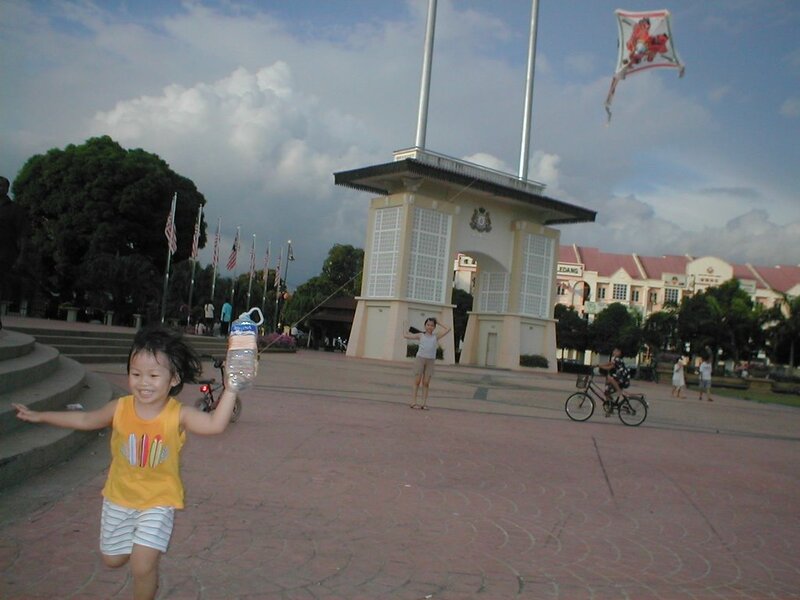 See, how happy she is when her kite flying high! 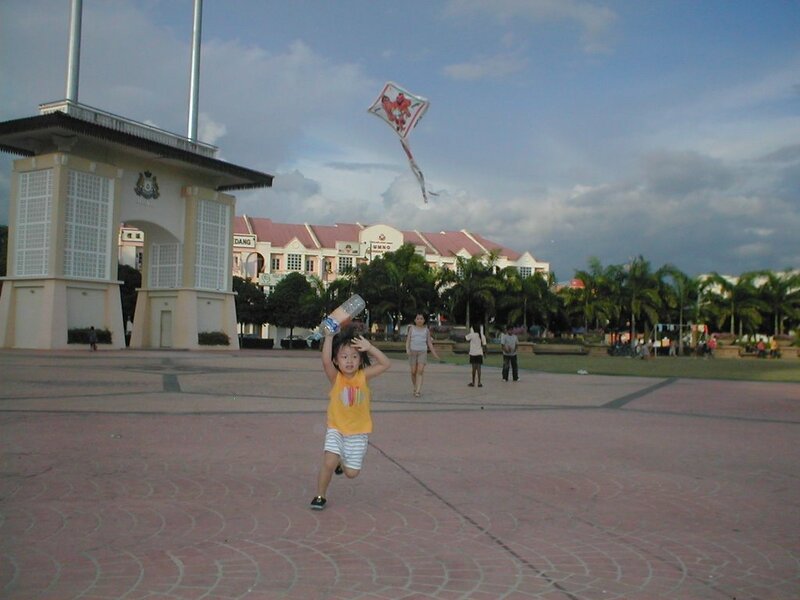 Believe many of you might ever play with kite, but frankly tell u, me never play it, not my childhood activity too! That's why hubby keep asking me to go along with them, so that I can learn flying kite too! Very happy evening.....with my girls and hubby. Definetely will come again during weekend if we not go for shopping! Ya, I had been a SAHM for 2 days, on last Wednesday & Thursday. 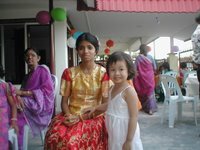 Mainly due to my MIL's sister(hubby's auntie) in Singapore pass away, she got to attend the funeral. This is the second funeral she got to attend since CNY. So poor thing, died during properous day! Lucky is me not so busy for this week, else dunno how to cope with! Well, I can say not really fun for me being a SAHM, quite tired look after the girls. Salute to all SAHM!! 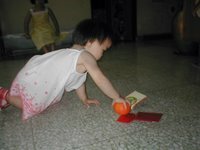 Wien still ok, she can do her own thing or homework alone, such as coloring, drawing, writing or watching carton movie. But sometimes she too very demanding, want mummy to accompany her if she see Lyon too attached to me! As for Lyon, she is too mobile, keep walking here and there, also keep asking me to give her mum-mum(food), she is such a wai sek moi! Lucky MIL only went for 2 days, if she went for the whole 5 days, I think I will lost by at least 2 kgs! 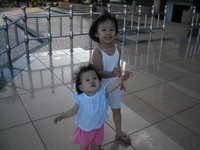 Not easy to take care 2 kids at one time, cannot imagine if I have 3!!! p/s: This is an back dated post, was draft it last week, today posted it with some funny pictures! 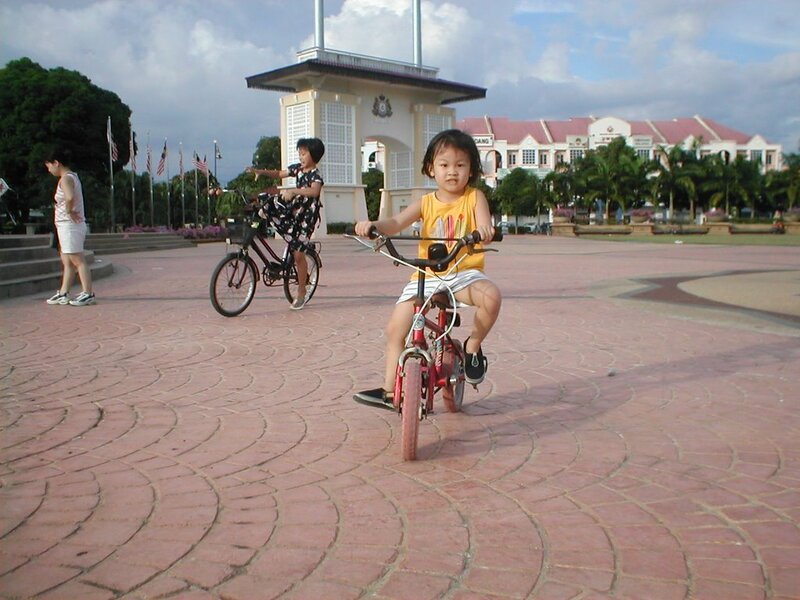 Can u see the bicycle with the support, where Lyon play with it. Now no more with that support. 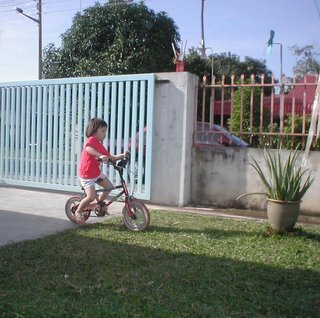 She happily cycling around kaki lima, papa even drove out his car to outside, so that she can has more spare to cycle! 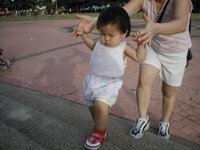 Photo taken right before she fell down...opps...must be painful la my girl! Lots of happening during this Sunday. Firstly I able to meet with Tracy & her family at McD Mahkota Parade! We select that place becos it has the playground, kids can enjoy themself and we can have chit-chat while watching them. She is first mummy blogger I ever met so far. Others dunno when can we have the chance. 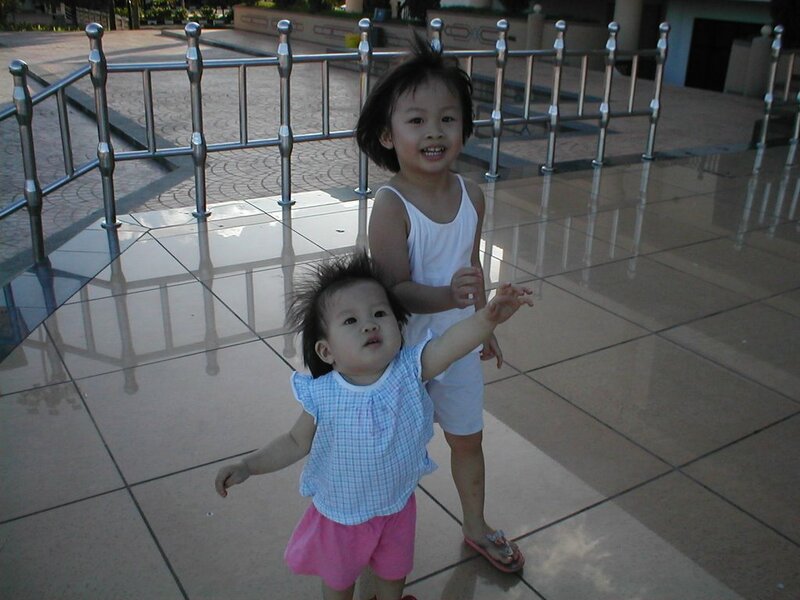 Elyss also come along with Tracy, with her cute little Charlett, too bad, hubby not manage to take Charlett photo! I meet Tracy's hubby too. Nice to meet you guys! Never seen Tracy in person before but I guess I can recognised Destinee since can find her photos in her mum's blog. Tracy brought me one container of her handmade Golden Crispy. It is really nice, I appreciate that! Also some chocolate and peanut. Paiseh, paiseh! After Tracy & family left, we still in the playground for more than 1/2 hr, as Wien wants to continue playing the sliding. 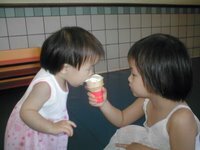 She also requst her papa to buy her ice-cream, becos her stomach is hungry wor....papa teasing her that hungry cannot take ice-cream but have to take rice! But at last , papa get her an ice-cream too. 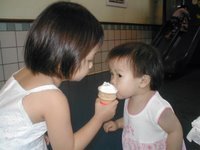 Later she share with Lyon as mummy not allow Lyon to have whole ice-cream. About 5.30pm, we left the shopping mall, as we need to rush back to attend our neighbour's daughter birthday party. They are Indian. 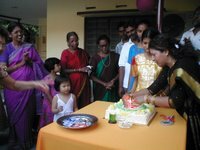 They invited our whole family to attend. I already left the present to MIL, remind her to go first and past to the birthday girl, just in case we are late. Reach home about 6.30pm, the part just started. Wow, all are local Indian food such as Chapatti, tossei, Indian fried mee, teh tarik...etc. The catering do the chapattin and tossei on the spot too, so still can feel the hot! Various kind of kuah serving there too, we duno how to eat what with what kuah, my neighbour come and explain to us. 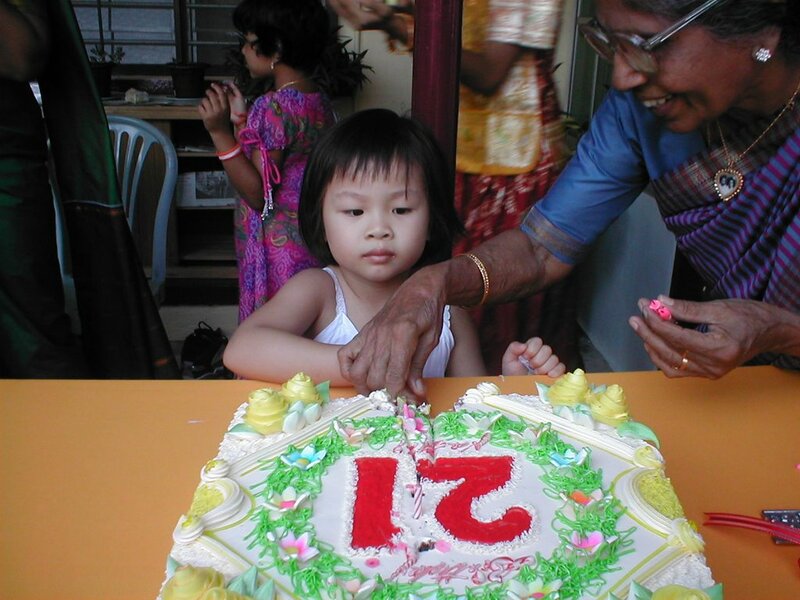 It was 21st birthday party, you can see the cake show age 21 in big. All her Indian relatives wearing sari costume. Wien interested at the magic candle, but she paiseh to go nearer and blow it. 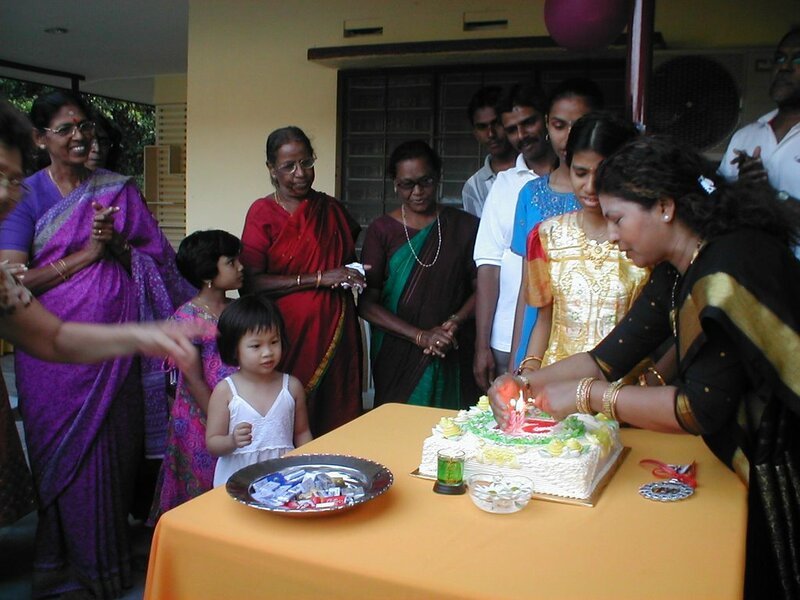 After the birthday girl blow it, neighbour get her to go nearer , also ask her to cut the cake for herself. She happily did it too! 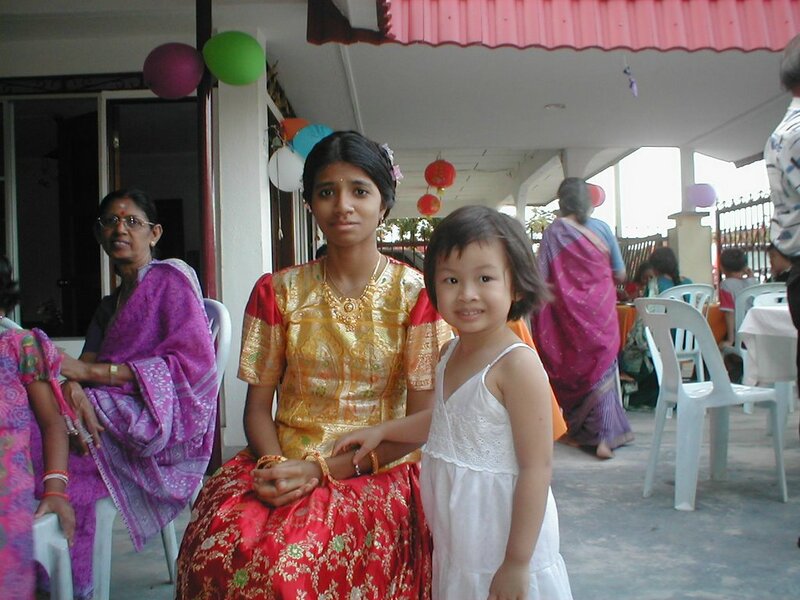 Overall we enjoy the Indian food, Wien enjoy most the chocolate, sure la, the chocolate from Swiss le, as the birthday girl's mum brought back from Zurich since she is working there... Today midnight also Hokkien people do the "pai tian kong" , another firecrackers and fireworks night. Wien well prepared for it as she like to watch too! Right after 12 midnite, people around here start the booming session liao. Lyon, me and hubby went to bed before Wien, as we need to work tomorrow...but couldn't sleep too, becos of the loud sound. Booming stop about 1am, after that only has peaceful night! 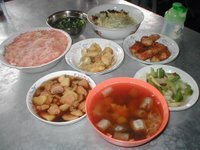 haih...looks like chinese really like yit-lau during great day hor! On 1st day of CNY, all of us wake up nearly 9am, as we only slept at 2am this morning. 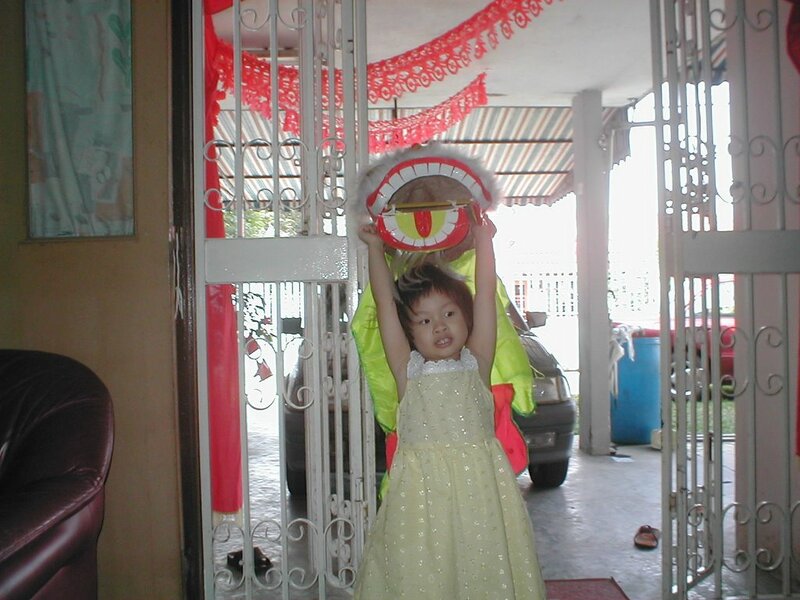 Daddy get Wien to do lion dance too before she manage to get her ang pow from papa! So bad daddy hor! Anyway Wien happily dance it after I bath her and change her into her new dress. Lyon keep clapping her hands while see her sister dancing! 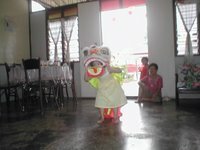 Wien lion dance at our house... Lyon go and get her ang pow...papa want her do the dance too...poor Lyon!! I travel back to my mum's place(Melaka) on 1st CNY, but only me, Wien and Lyon stay overnight there, hubby travel back to Tangkak, as he said he couldn't sleep well at my mum's house. 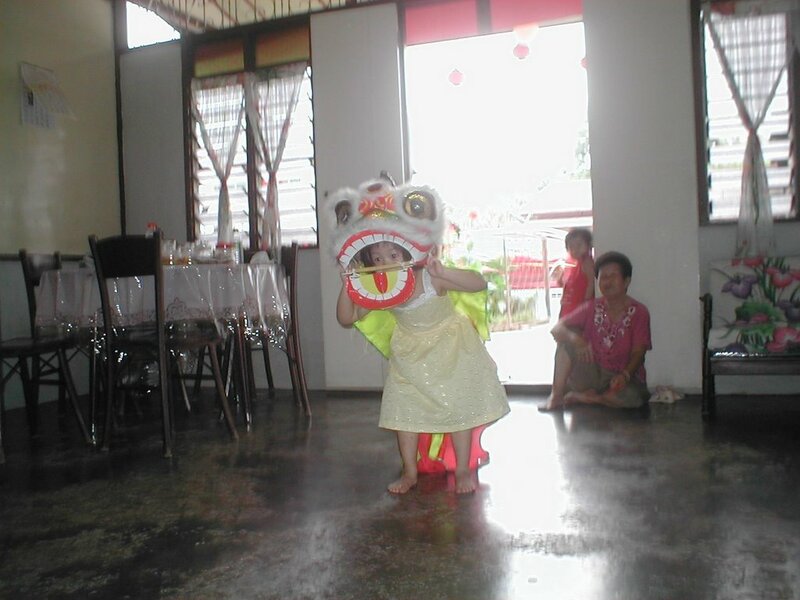 Wien also did her lion dance 向外婆拜年！Got her ang pow too! Later when my both sisters reach my mum's house, she re fuse to dance, no matter how we pursue her, maybe she feel paiseh in front of the 2 Ah Yee. My mum use to cook chai during 1st day, I use to practise it before marriage. After marriage, follow hubby side, no more chai on CNY. So this year I manage to eat chai, also get hubby, Wien and Lyon to eat too!! 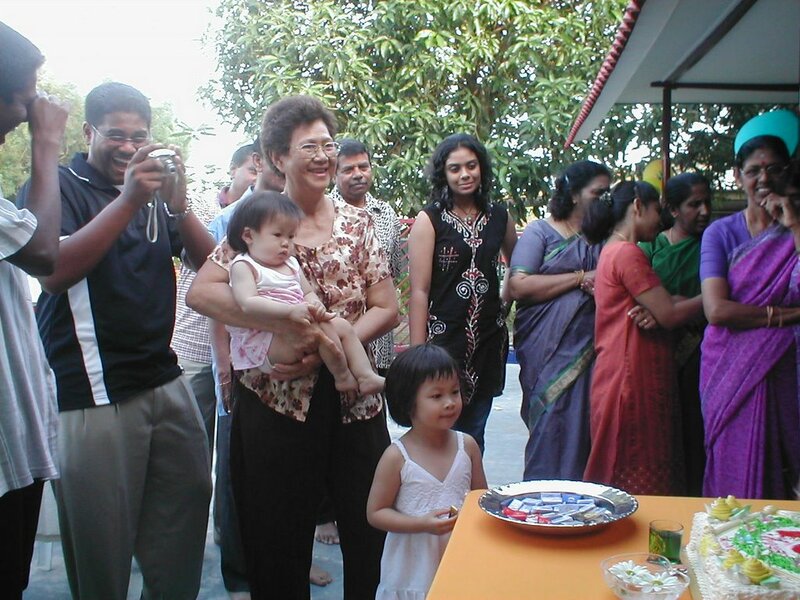 Our kind neighbour also cook us some chai dish, stay in kampung is good, as you will can have good & friendly neighbour! Wien dance at 外婆 house, 外婆 sit near the door...Wien pass mandarin to 外婆... Wien enjoy so much in grandmother house, she even can skip her afternoon nap, yet can stay up till 11.00pm! 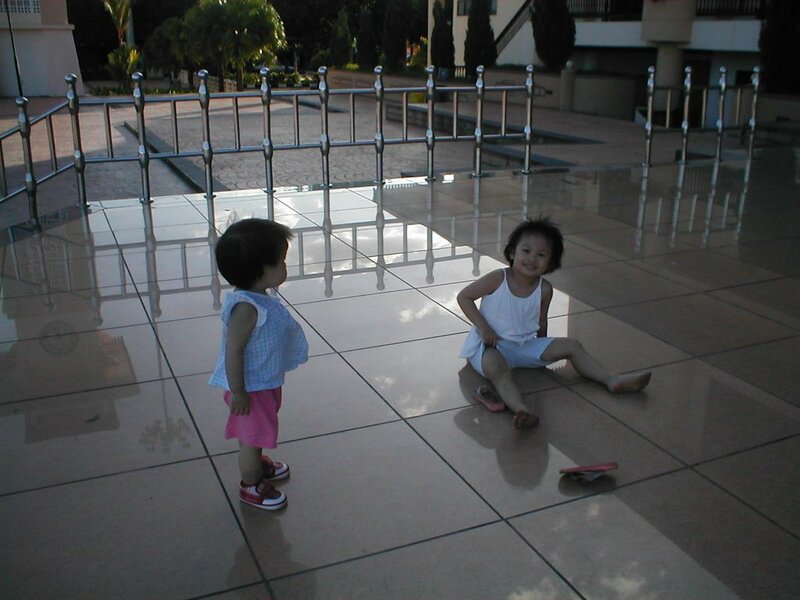 Other than 2nd sister's 2 boys(James & George), my neighbour's kids also come to our house and play with her. 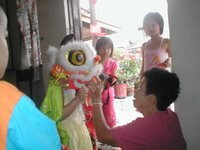 Those kids are more interested in her lion head, lucky after the 3rd day the head still in one piece. 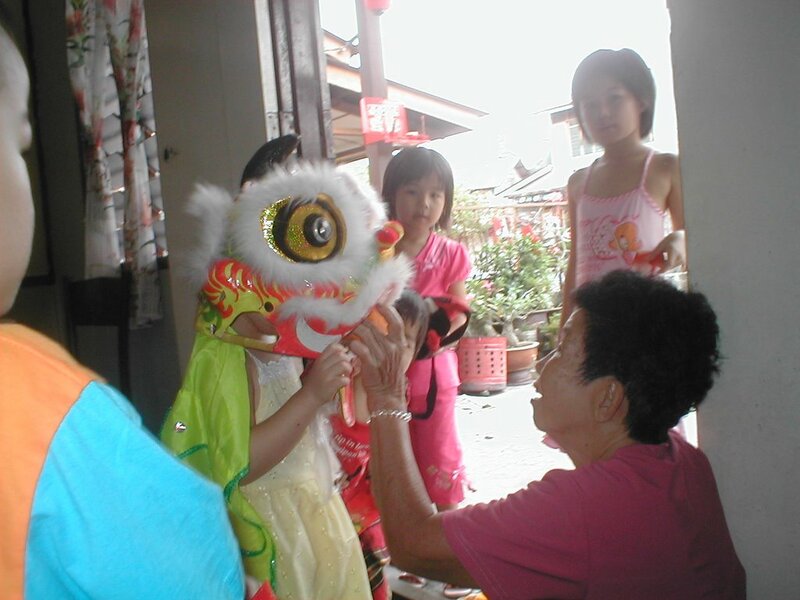 Last year, Wien not allow them to touch her lion head but this year she allow them do so, also can wear it some more! 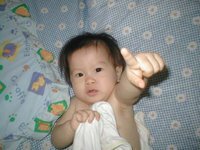 She is big girl now!! 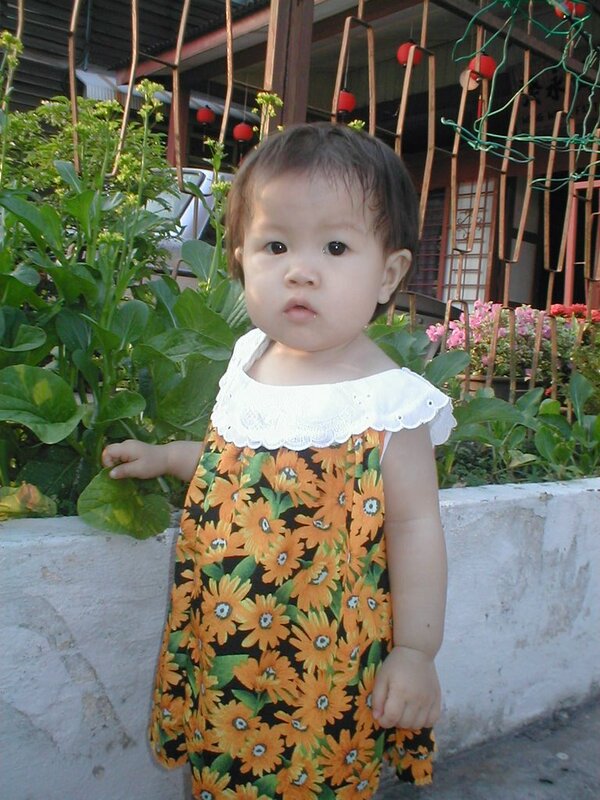 Zhi Yin (my brother's girl) back to her grandmother house too on the 1st day! Oppostie to Wien, Lyon seem not enjoy her stay there. She keep lau-kai and stick to me. I have to be within her eye sight, else she will cry madly! Really like a koala bear. First day she is ok, since hubby is around till abt 10pm, if me away from her eye sight, she can look for papa. The next day she whole day stick to me, me really headache, plus the weather so hot, make me lagi pening!! 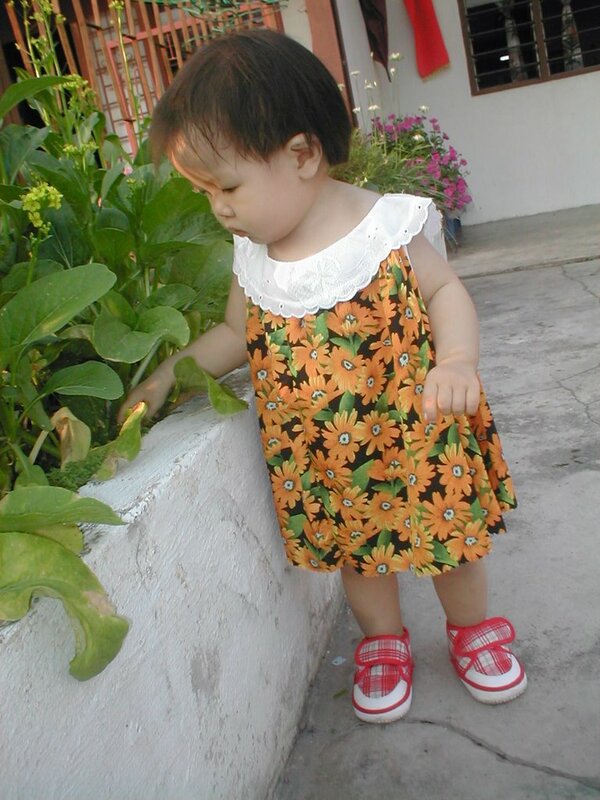 Anyway this is her first time to overnight at grandmother house. Before this we will come in the morning and travel back the same day at night, since it only took us 45 min drive! 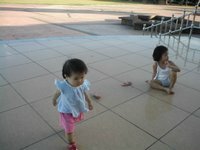 We stay till 3rd CNY, Wien ask me to stay one more day as she still want to play with those kids! haih..if Lyon not lau kai, for sure I will stay extra night!